For the past two and a half weeks, I've walked Grace to her class at Beckemeyer Elementary School, charting the same route I walked as a youngster. Yes, this year, Grace made the transition from preschool at our church to kindergarten at the public elementary school. Kyle and I did a lot of talking about the prospect of kindergarten over the last few years. 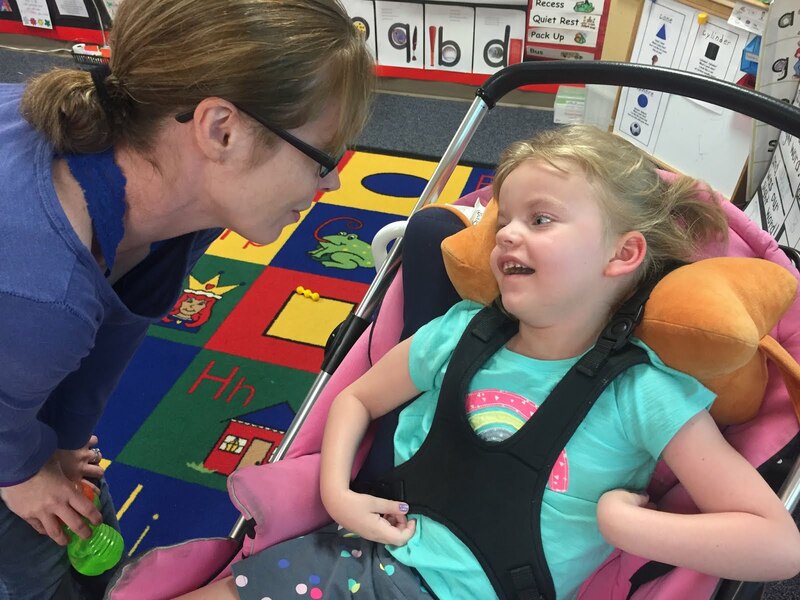 Grace had a wonderful experience in preschool, going just a couple of hours each morning for three days a week. 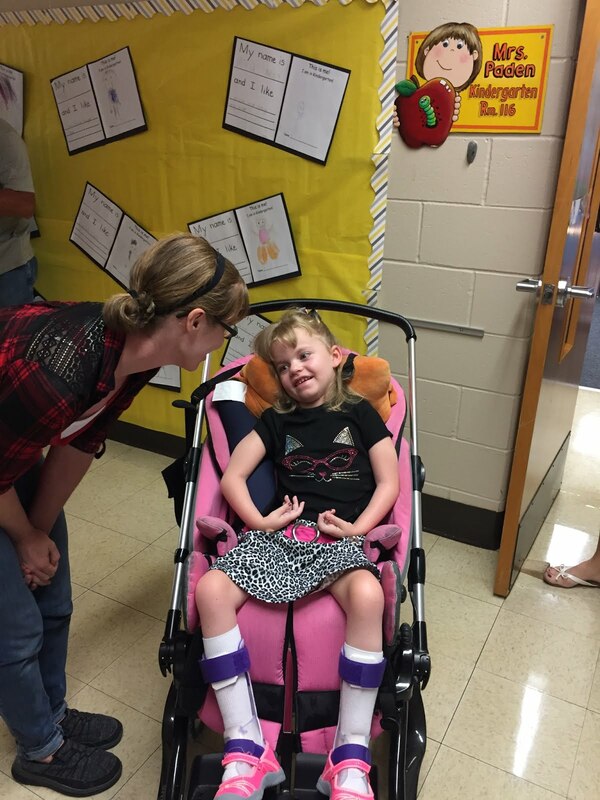 We knew Grace wouldn't be able to make it an entire day for kindergarten. She would just get too tired. And one of us would have to go to feed her lunch if she had been there all day. We have also worried a bit about illnesses in the school, and Grace's susceptibility to them. So, there were lots of reasons not to send her to kindergarten. But the more we talked, the more we knew it was something we wanted her to experience. One of the things we have loved about her time in preschool was the interaction she has with the kids. I have worried myself silly that no one would want to be around Grace because she's different, because she can't run on the playground with them or respond to their questions. But I'm constantly amazed at how much these kids love Grace. It actually makes me believe in the future of our world with kids like these taking charge someday. We finally decided on two hours a day four days a week. Since Grace goes to physical therapy in Springfield on Fridays, we opted not to send her to school that afternoon because she would be too tired. 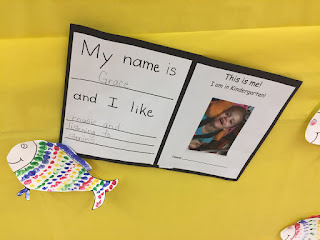 I had actually hoped that mornings would be a good fit, but we found out that Grace would have the most interaction with her classmates in the afternoon. Since she still gets speech therapy and physical therapy outside of school, I wasn't worried about her getting those services during school. 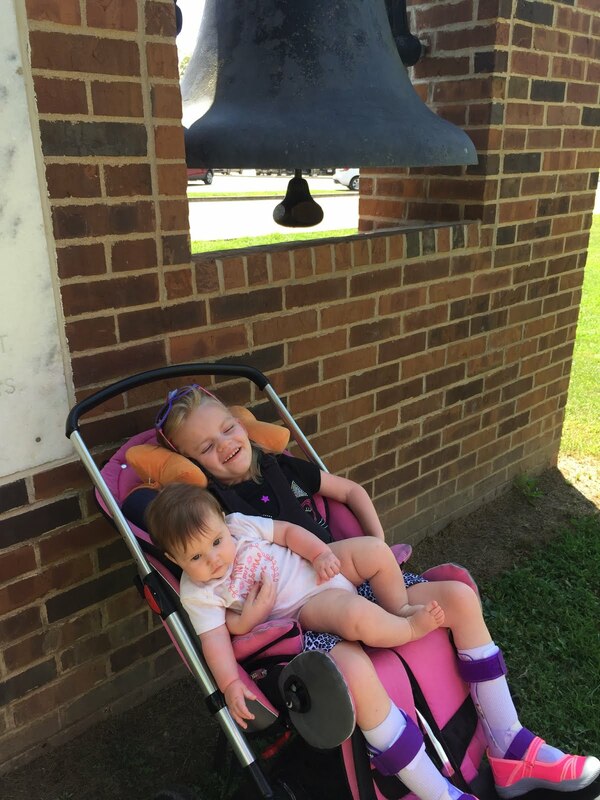 Our hope was to provide Grace a chance to see other kids, which she seems to really love. In fact, when I took her to school one day this week, a little boy named Paxton came right over to her as soon as we got in the room to greet her. Grace gave him a big smile, and it just warmed my heart. 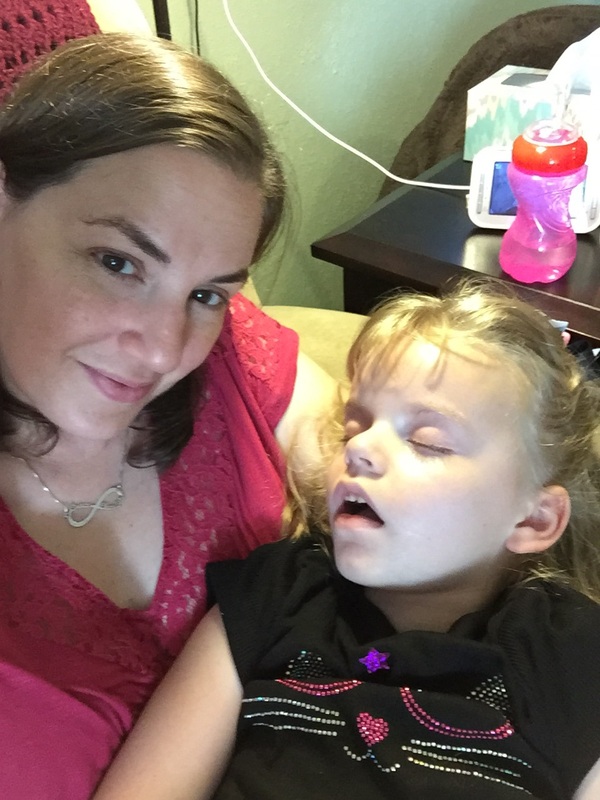 Even though we don't really know how much Grace understands, we try to give her as many "normal" experiences as possible. Mom and I took her shopping for her school supplies, and tried to pick out things that a five-year-old girl might choose. 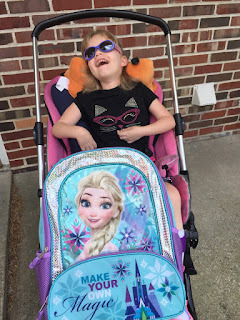 I have always loved school and office supplies, so I picked lots of fun things in bright colors and a brand-new Frozen backpack that says "Make Your Own Magic." I liked it better than the one with the rainbow colored poop emoji, but it's hard telling which one Grace might have preferred. Then, Kyle and I went to parent orientation night the week school started. I hadn't really planned on going since we had already had Grace's IEP meeting, and we kind of knew where things stood. But Kyle felt it was our responsibility as kindergarten parents to go, and I'm glad that he talked me into it. 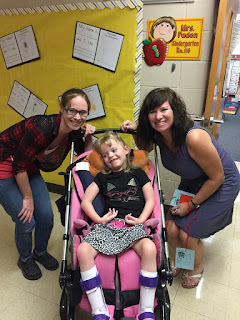 It was fun to meet the other parents in her class and see her room. I did have a little bit of trouble as Grace's teacher talked about all the things the kids would learn that year, and that some of them would even start reading. Kyle knew I was having some trouble, and he just reached over and squeezed my leg, just to let me know it would be okay. Sometimes I just need a reminder to celebrate Grace's accomplishments, even if they aren't the same as other kids. Even though we had already met with her teacher, her aide, the school therapists and special education teacher, I still found myself nervous before taking her to school that first day. But it didn't take long for me to realize this would be a great experience for Grace too. 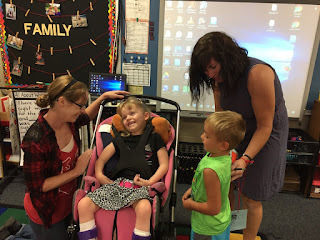 All four of us walked Grace to school the first day, and her teacher immediately brought all the students in her classroom one at a time to meet Grace. I think Grace had a smile for all of them. We left, knowing she was in good hands, and in for a special treat. In the days since then, Grace has enjoyed reading books and listening to music at school. She loves seeing her friends, and the puppets in her classroom. Each of the kids has a picture on the hallway before the classroom, and Grace even has one of her own. 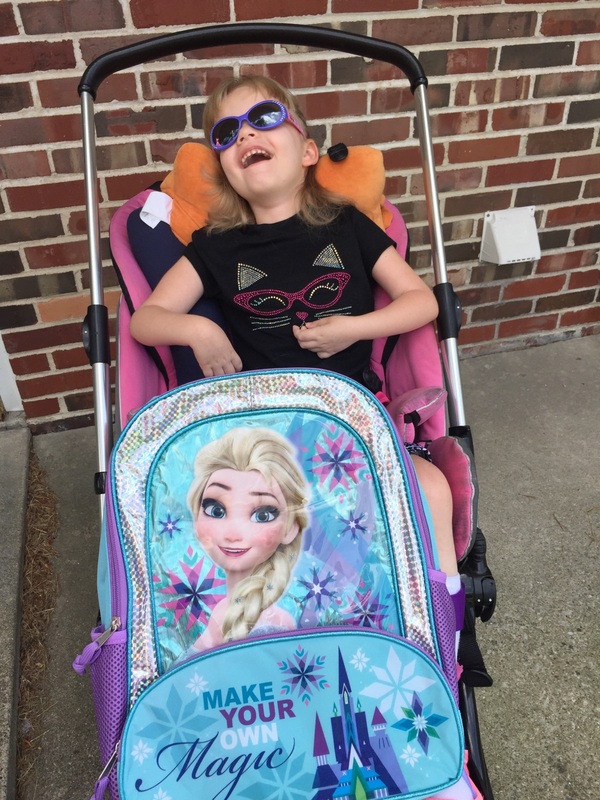 Even though Grace's kindergarten experience will be different than most kids, we're still excited for the book orders and classroom parties, and just letting Grace enjoy her own school experience. 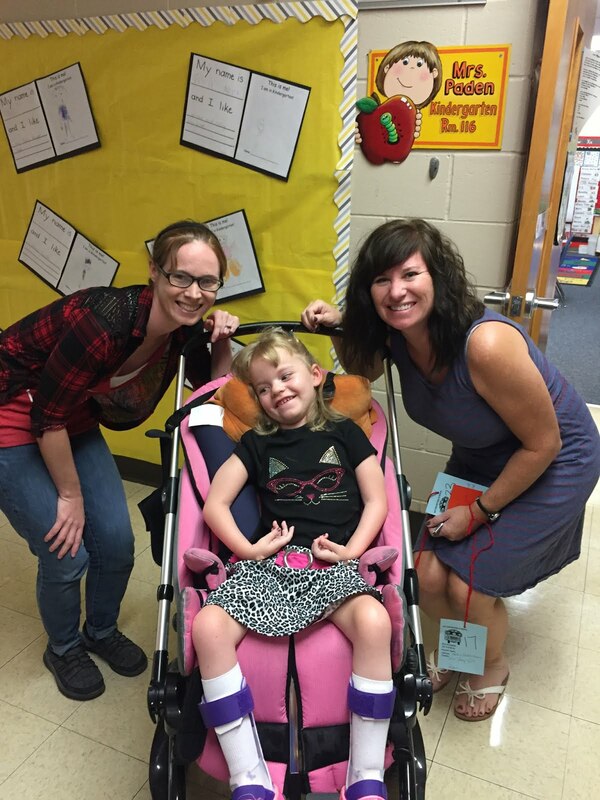 Grace just loves hanging out at kindergarten! So, when you see us walking home from school, make sure to stop and ask Grace how her day was, you'll probably get a big smile.